A very good camera indeed. I use it as secondary camera for travel apart from my Pentax SLR (earlier K-x now K-5). It is much lighter, offers greater zoom range and can write video in much lighter format, the motor driver zoom is also an advantage while filming. that ultrazoom, while not very suitable for taking nature pictures in Latvia, works quite well in the Mediterranean. Latvian nature is very demanding for cameras, the color palette is very subtle, much hangs on ability to represent fine nuances of grey, brown and green colors as well as harsh contrasts. In the south colors are much brighter and lighting generally better so the difference of quality between SLR and ultrazoom seems to be much smaller. 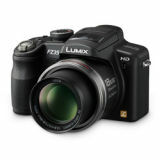 Great camera with amazing set of features: 12 MP, spot metering, HD video, 18:1 optical zoom (27-486 35mm equiv. ), good noise performance, raw mode, good sound recording quality, and the list goes on. Importantly the image quality is excellent thanks to the Leica aspherical lens. A bargain at the price. European model is called FZ38.